The runt of the litter and ninth in line from the sun, Pluto was - for 75 years after its discovery - considered a peer of hefty Jupiter, Saturn and Uranus. And then one day it wasn't. "People like to root for the underdog," said Kirby Runyon, a Johns Hopkins University scientist behind a renewed effort to restore Pluto's lost title. Runyon and some leading planetary scientists have launched what might be the best shot in years at returning the icy rock now known as a "dwarf planet" to what they consider its rightful orbital place. And Pluto wouldn't be the only one up for a promotion. Its advocates' generous definition of a planet would include Earth's moon and crowd the cosmic neighborhood with 110 planets. The matter will be considered next week at the Lunar and Planetary Science Conference in Texas. Runyon, 31, a doctoral candidate in planetary geology, recently waded into a long-simmering debate with the biggest names in astronomy. "This is really just a Pluto-nostalgia thing dressed up like science," said renowned planet hunter Mike Brown, an astronomer at the California Institute of Technology, who literally wrote the book on Pluto's ouster, called: "How I Killed Pluto and Why It Had It Coming." "The Pluto-huggers think this is their chance," Brown said. Pluto's popularity surged after a NASA flyby in the summer of 2015 revealed ice mountains, hazy clouds, canyons and cliffs, capturing imaginations everywhere. Images even revealed evidence of volcanoes. Admirers among the public were invited to suggest mythology-themed names for these Earth-like features. "Dear Pluto, lookin' good. But you're still a dwarf planet - get over it. Love, Neil deGrasse Tyson," the celebrity astrophysicist and director of Hayden Planetarium in New York City, wrote on Twitter at the time. Tyson and Brown gravitate toward the 237 astronomers who convened in Prague in August 2006 and voted Pluto out of the planet club. The controversial vote by the International Astronomical Union - 157 members were opposed - rewrote the universal definition of the planet. 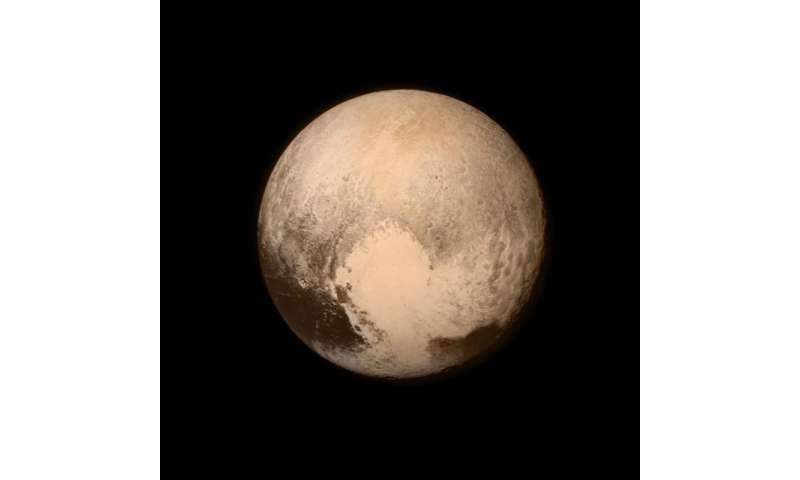 Overnight, Pluto was relegated to dwarf planet status. The IAU's new criteria required that a full planet must "clear the neighborhood around its orbit," meaning it must gravitationally dominate its surroundings and slingshot away debris. "This was a hail Mary attempt on the part of the IAU to declassify Pluto," Runyon said. "No planet has totally cleared its orbit." Even mighty Jupiter has a cloud of asteroids. The strength of a planet's slingshot forces decrease as it gets farther from the sun. Earth wouldn't clear the debris way out in Pluto's neighborhood, Runyon wrote. So he co-authored and proposed a new definition with scientist Alan Stern, the principal investigator for NASA's Pluto flyby. "Among planetary scientists, almost no one considers it anything but laughable," Stern said. "The astronomers went into an area they don't own or know very much about, and they made a mess of it." Here lies the rift over the Pluto identity: on one side, astronomers, and on the other, planetary scientists. "If you're off in the woods and need emergency brain surgery, but the only doctor around is a foot doctor, you better say your prayers," Stern said. "This is what happened: The podiatrists got hold of the brain surgery of planetary science." Brown, the Pluto killer, discovered in 2005 another shape in that far-flung neighborhood, and it was the densest one yet. His discovery of Eris, a little smaller but denser than Pluto, partly prompted the IAU to reconsider what makes a planet, well, a planet and rewrite the definition. "The only reason Pluto was ever considered a planet was because people were grossly mistaken with how big it was," Brown said. The New York Times reported the discovery in 1930 with an article suggesting Pluto could be bigger than Jupiter - it wasn't. In the following decades, the perceived size of Pluto would shrink and shrink. Now Pluto is understood to be roughly the size of North America. One could line 59 Plutos across Jupiter's equator. By volume, more than 200,000 Plutos could fit inside Jupiter. Pluto's closest neighbor is Neptune. "If Neptune were a Chevy Impala parked at the curb, ask yourself what car would Pluto be? ... It would be a matchbox car," Tyson said in an interview with TV host and comedian Stephen Colbert. During his appearance, Tyson wore a planetary necktie that omitted Pluto. "If it's not on a casual accessory owned by Neil deGrasse Tyson; it's not worth knowing," Colbert quipped. "Forget it, forget it, who cares?" Al Tombaugh sure does. His father was just 24 years old and farm-raised, the sort who taught himself to build telescopes and scout distant space, when he spotted Pluto in February 1930 from Lowell Observatory in Flagstaff, Ariz. Clyde Tombaugh became the first American to discover a planet, and he would die about 10 years before his find was reclassified as a dwarf. His son, Al, learned of the vote when a reporter called soon after. "It caught me completely off-guard, me and my mother and my sister," said Tombaugh, a retired banker and contractor in New Mexico. "It's just tremendously flawed and it's unfortunate it was ever brought for a vote ... It took (Pluto) out of the public view." Pluto's fans at New Mexico State University carried picket signs proclaiming "Size doesn't matter!" The debate spilled into popular culture with cartoons of a sad-eyed pup beside Mickey Mouse. There were petitions and ironic T-shirts: "It's okay, Pluto. I'm not a planet either." The defiant city council in Madison, Wis., adopted a resolution declaring Pluto "Madison's ninth planet." Science teachers around the world changed lessons, took down posters, added disclaimers to textbooks. "The students got it. They're not as emotional about it as the adults and teachers were. Some of them were fighting mad over it," said Tim Kent, who runs a traveling space lab for Baltimore County schools. "I understand why they did it. There may be 2,000 rocks out there. How can you call them all planets?" The reworked IAU definition maintains old requirements that planets must orbit the sun and have enough mass and gravity to wrap themselves into a ball. "If you look at the solar system with fresh eyes," Brown said, "you realize there are eight dominant bodies and everything else is being pushed around by these eight bodies." Runyon, however, proposed a definition that dramatically eases the standards: "Round objects in space that are smaller than stars," he wrote. But there's an exact science packed in that simplicity. Any round planet must possess enough mass and gravity to pull itself into a sphere. Tiny Pluto meets this criteria, so does Jupiter. "Nobody is going to say a hummingbird femur isn't a femur just because it's little," Runyon said. Anyway, he isn't asking the IAU to accept his definition. He hopes it catches on among science teachers and students. The astronomers are more concerned with the external orbit-clearing forces, he said. "If planets were people, the IAU would define people on who they hung out with and what bars they visited versus who they are on the inside," he said. It's a message he hopes resonates with admirers everywhere of one former runty, underdog planet. Mike Brown is far from "renowned," and the mainstream media need to stop enabling his very unprofessional and unscientific claim that he somehow "killed" Pluto. He did absolutely nothing of the sort but is using that concept to brand himself as a means of pursuing money and fame. Brown was one of three scientists to discover Eris, which is marginally smaller than Pluto. One of his fellow co-discoverers, David Rabinowitz, signed a formal petition rejecting the controversial IAU decision back in 2006, along with hundreds of other planetary scientists. The media should never have reported that vote as equating to Pluto losing its planet status because that vote never was more than one view in an ongoing controversy. It was adopted by four percent of the IAU, most of whom are not planetary scientists but other types of astronomers, and was rejected by an equal number of professional planetary scientists in the formal petition mentioned above. These planetary scientists have been ignoring the IAU decision for over a decade. What should have been and should be reported is that Pluto's status remains a matter of debate. Science is not decided by decree of "authority," and there is absolutely no reason the IAU decision should be given any more legitimacy or sense of being official than any other scientific definition currently in use. This latest proposal is NOT nostalgia. It is motivated by the same reasoning that motivated the original rejection of the IAU decision--preference for a geophysical rather than a dynamical planet definition, meaning one that puts an object's intrinsic properties first and foremost, ahead of its location. Brown is wrong in stating that the only reason Pluto was ever considered a planet was because people thought it was much bigger than it really is. First, Pluto's status was debated from the time it was discovered in 1930 because telescopes of the time were not powerful enough to resolve it into a disk. Even when telescopes became powerful enough to do this, no one knew that they were actually looking at two objects spaced closely together rather than at one until 1978, when Pluto's large moon Charon was discovered. Charon and Pluto are separated by just 12,160 miles. Because the two objects orbit a center of gravity between them, they are actually a binary planet system. New Horizons' findings in its July 2015 Pluto flyby show that Pluto is a geologically active world with many of the same processes and features as its larger counterparts. Claiming that "nostalgia" is the reason behind this new proposal amounts to ignoring New Horizons' findings and essentially creating a straw man argument aimed solely at discrediting those who support a geophysical definition. According to the geophysical definition, dominance has nothing to do with whether an object should be considered a planet. Some objects dominate their orbits; these are classical planets. Others don't dominate their orbits but are rounded by their own gravity and have complex planetary processes. These are dwarf planets. The key is dwarf planets are a subclass of planets, not another type of object entirely. I have to agree that the Pluto-huggers aren't motivated by logic or science but out of emotionalism. Personal attacks against Dr. Brown are certainly out of order. Definition of planet, asteroid and comet. One to sit on, one the sit in and the other is an ejector seat. Mike Brown does not include Charon in his Dwarf Planet database on grounds that it is a moon. In fact the barymetric center is between Pluto and Charon, which makes it a binary system and in my view both are planets. There are about 500 round rocks not in the Kuiper Belt with an estimated 1000 within it. Everyone should have a waystation, with a bartender on it and a sign. Pour it down not up.